"Losing a loved one is never easy. But our God promises to..."
R. Lamar Smith, 65 of Graceville, Poplar Springs Community, passed away Wednesday, September 12, 2018, following a courageous battle with cancer. Lamar was born in Graceville on October 9, 1952 to the late Ralph and Mary Bell Wood Smith. 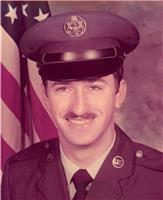 A graduate of Poplar Springs High School, Class of 1970, Lamar was a veteran of the U.S. Air Force where he served for over 13 years. He loved golfing, fishing and was an avid Gator fan. Predeceased by his parents and one brother Lance Cpl. Albert E. Patrick Smith. He is survived by one son Ralph Smith(Terri), Graceville, one brother Mike Smith(Shelly), Ft. Smith, AR, three sisters Mary Blair(Ronnie), Graceville, Patricia Martin, Columbus, GA, Melba Morrow(Jim), Highland View, TX, three grandchildren Ender, Austin, Isabella, several nieces, nephews, cousins and two very special fur-babies Sparky and Daisy.